Your education, business and entertainment are associated with Android device closely. Thus once you switch a new device, you will soon realize that data on the old device is so precious and essential in your daily life. However, it is cumbersome to transfer all the data from old device to the new one manually. At this time, AnyTrans for Android may be your optimal choice to move the data on the phone with a few clicks. Please refer to the following guide to make good use of AnyTrans for Android. At first, please make sure you have launched USB debugging option on your Android devices. By default, AnyTrans for Android will detect your Android devices automatically. 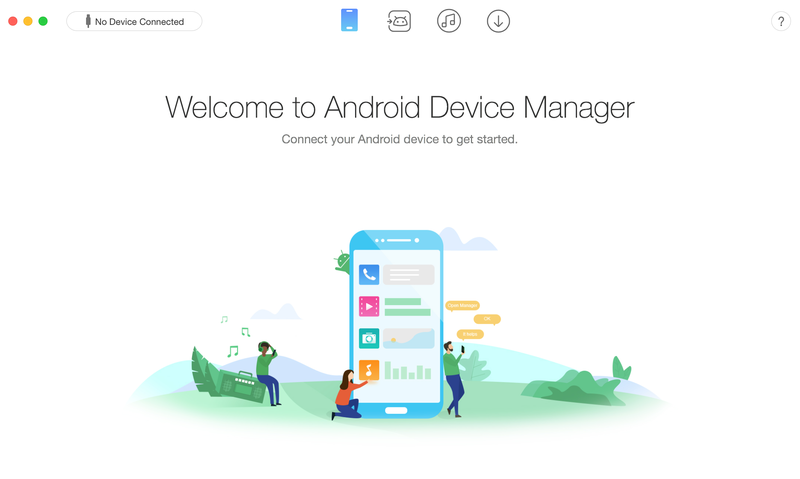 If you don't connect Android devices to computer or your devices are not recognized, you will see the interface below. Once your Android devices are recognized, the main interface will display. 1. Please download the latest version of AnyTrans for Android. 2.Please check if you have enable USB debugging option in Settings. 3. Please check whether your USB cable is loose. If it is, please reconnect it. If USB cable is broken, please give new one a try. 4. Please make sure your device can be detected by your computer. 5. Check whether you have the latest version of USB Driver and ADB Driver on your computer and device. If not, download and update from Android device official website. 6. If problem persists, please contact our Support Team for further diagnosis. 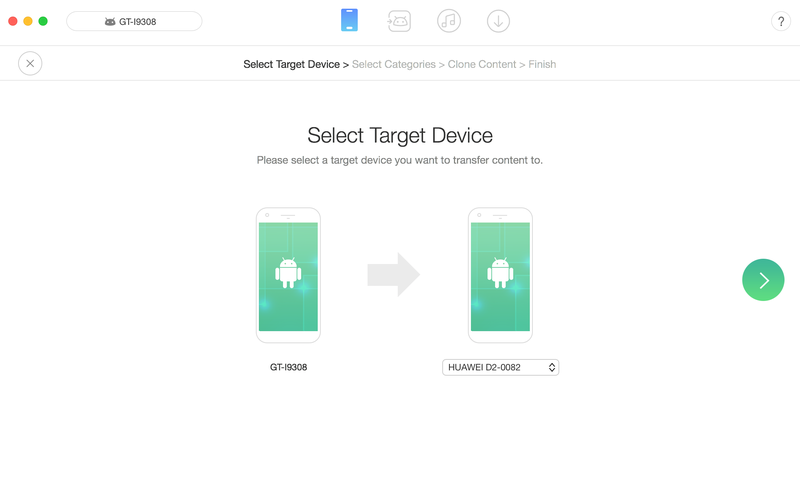 Please carefully check whether you have chosen one device as the target device correctly before launching the clone process. 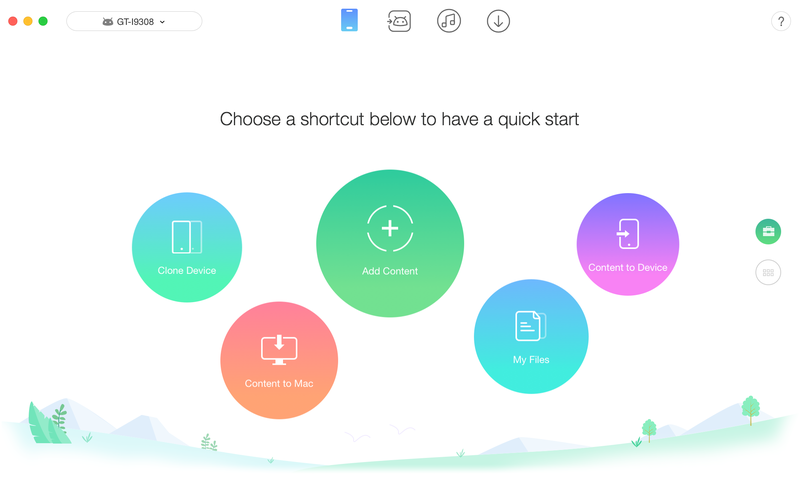 After clicking button, AnyTrans for Android will load your files automatically. Meanwhile, AnyTrans for Android will only list the file icon for you to select when your Android device has such files. 1. 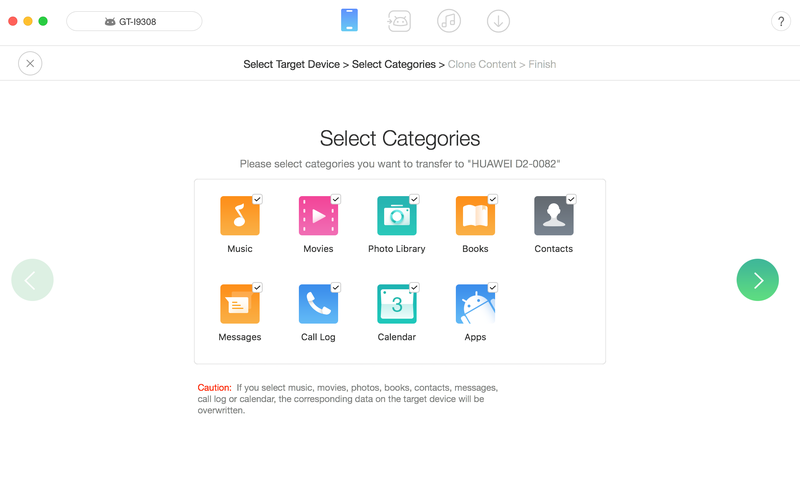 If you select Music, Movies, Books, Photo Library, Contacts, Messages, Call Log or Apps, the corresponding data on the target device will be overwritten. 2. Please do not disconnect your devices during the whole cloning process, or your data will be erased permanently. After clicking button, the clone process will begin. The time to clone may vary based on the size of your data. Please keep patient. Once the transferring process is completed, you will see Content Cloning Completed Page. To go back to the main interface, please click button.